Are your teeth discoloured or stained? Do you smoke/drink coffee? Over time teeth can lose their whiteness and become stained or lose colour. Tooth whitening is a terrific, non-invasive procedure that will put the pearly white back in your smile. Many over the counter teeth whitening products do very little to improve the colour of your teeth and can in fact be bad for them. Dental on Kennedy either a clinical procedure or take home pack that you can apply yourself. Our take home kit is a popular method for teeth whitening. One simply takes a custom fitted tray and applies bleaching gels to it before fitting it to the teeth for a specific period of time. Our take home kits have received overwhelmingly positive reviews particularly when used in conjunction with clinical whitening procedures. The most effective way to bleach teeth is using the new Philips Zoom (4th generation). 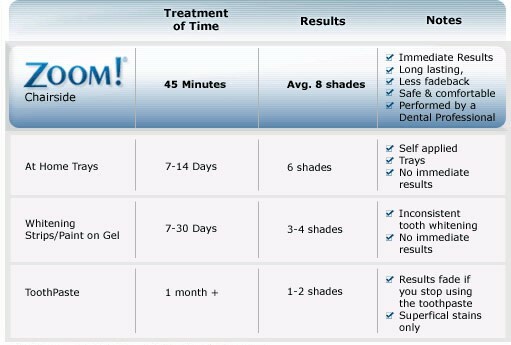 With Zoom, your teeth will be visibly white in one day with zoom in office achieving up to 8 shades whiter in 45minutes. Dental on Kennedy are Teeth whitening experts ensuring a bright smile with no damage to the tooth. Contact us today for more information. Philips Zoom is asked for by more patients than any other brand. 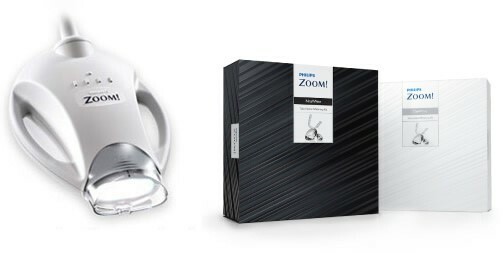 The new improved Zoom WhiteSpeed is clinically proven to whiten teeth up to 8 shades in 45 minutes. That’s 40% better than a comparable non-light activated system. The new LED light technology emits at the optimal light spectrum with 100% greater light intensity than the closest competitive lamp. The light then activates a photo catalyst within Zoom Chairside Light-Activated Gel to greatly accelerate and enhance whitening results and deliver the dramatic results your patients will love.